Shivani Siroya ’04 (center), CEO and founder of Tala, has assembled other Wesleyan women on her team to change the financial lives of those in developing countries—including Lauren Pruneski ’04 (left), director of global communications and public relations, and Bonnie Oliva-Porter ’04 (right), director of global operations. Also at Tala, but not pictured, is Amy Barth Sommerlatt ’04, expansion strategist. No one has ever questioned Jenipher’s work ethic. For decades, this 65-year-old Kenyan woman has operated a food stall in the central business district of downtown Nairobi. It has given her the wherewithal to support a family of three sons, and she has paid for the vocational school education of each. She is also the leader of a local group of responsible adults who support each other in their efforts to save money. Yet despite those facts, Jenipher had no credit rating. Like some 2.5 billion people worldwide, she lacked a financial identity, the very thing that traditional banks evaluate when deciding whether to make loans to consumers. Her capacity to borrow money in order to grow her business and improve her life was virtually nonexistent. She did have one thing going for her, though. Like more than a billion residents of the planet’s emerging markets, she owned a Smartphone that she regularly used for a wide range of activities, from business management to communications with local friends and associates as well as family in Uganda. Three years ago, one of her adult sons encouraged her to download the “app” of a Los Angeles-based company called Tala, and it changed her life. 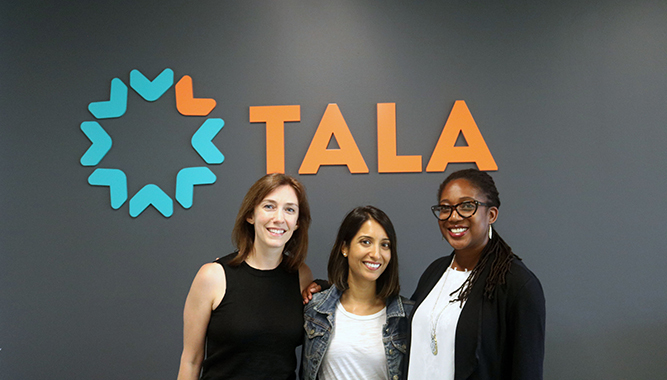 Tala, initially known as InVenture, was launched in 2011 by Shivani Siroya ’04. At Wesleyan, Siroya majored in economics and international relations. She began her career in equity research at the Switzerland-based international financial services company UBS AG, then attended graduate school at Columbia, where she earned an MPH focused on econometrics and health economics. Next, her work at the United Nations Population Fund provided “the amazing opportunity to interview thousands of microfinance borrowers in nine different countries,” she recalls. While noting microfinance has certainly helped broaden financial inclusion, Siroya observed that it wasn’t fundamentally changing people’s access to the formal financial system. It also wasn’t tailored to a customer’s unique needs. Most micro-lenders relied on a process that was typically not tech-enabled, and thus, very slow. Customers often had to apply for loans in person with an agent, where, in lieu of financial records or collateral that an agent could use for underwriting, they needed to provide friends who could “vouch” for them, have a pre-existing relationship with the loan officer or microfinance group, or pay really high-interest fees—among other inconveniences. With perspective gleaned from these interviews and travels across Sub-Saharan Africa and Southeast Asia, Siroya began to noodle an idea that would become the foundation of her innovative business, which serves needs that microfinance can’t meet. Siroya decided to approach the delivery of credit in a completely new way. Her company, with the mobile app she developed with a technology team, uses paradigm-breaking algorithms to assess more than 10,000 data points seamlessly gathered from customers’ smartphones. Though most applicants have little or no formal financial history, the system looks at other factors—such as stability of residence, longevity of employment, and strength of support networks—that can be used to quickly evaluate customers’ willingness and ability to pay. In other words, it provides nearly instant underwriting—with loans available in less than five minutes for customers who are mobile money users, and less than a day in markets where mobile wallets aren’t as common. Loans are customized, based on the applicant’s capacity and needs. In the first year after Tala (then InVenture) was deployed in Kenya, the company issued some 200,000 loans, including one to Jenipher, who used the money to expand her business with two additional food stalls. Currently, Jenipher is opening a restaurant. In the process, she has increased her savings by an impressive 60 percent. A scant four years since it was launched, Tala is a successful and rapidly expanding presence throughout East Africa and Southeast Asia, already making more than 2.5 million loans to date, for a total origination of more than $110 million as of June 2017.